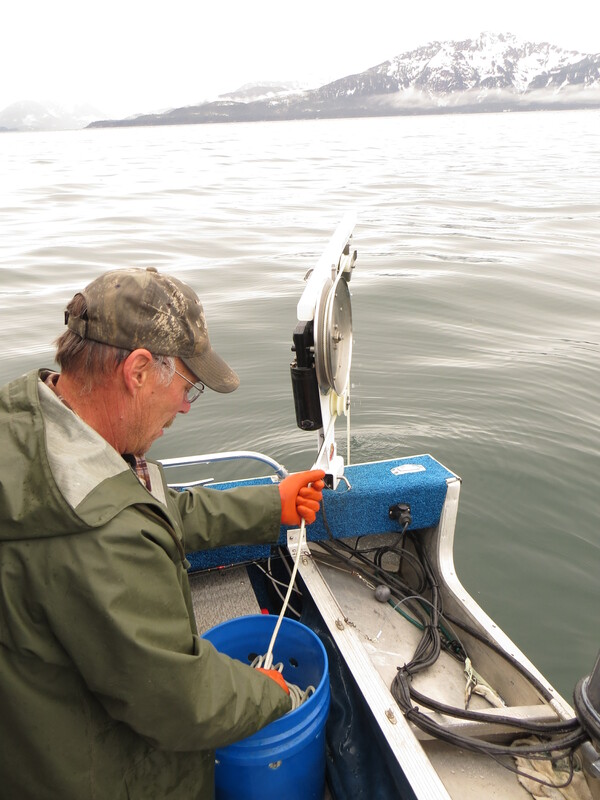 Over Mother’s Day weekend, my husband and I traveled to Prince William Sound to fish for shrimp and halibut. Once more the halibut won, but we had lots of fun and found some succulent shrimp. The land and sea were fairly colorless. Our boat and gear look so colorful. 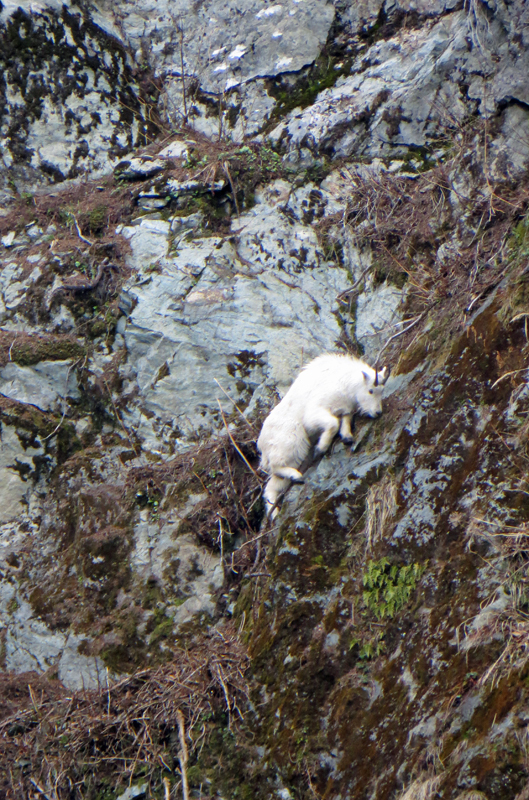 We saw goats eating on rock cliffs and scores of migrating waterfowl. 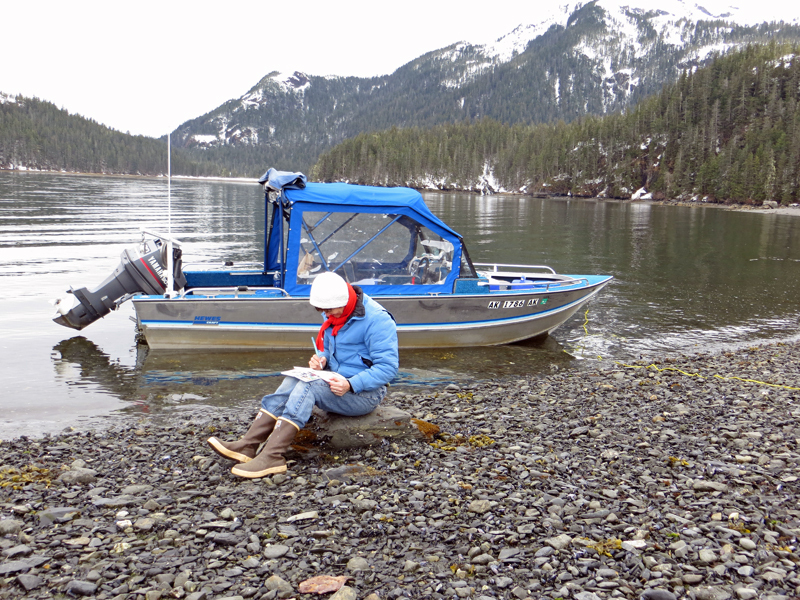 There was a lot of snow on shore, but we walked along the tide line and I sat on a rock to sketch. 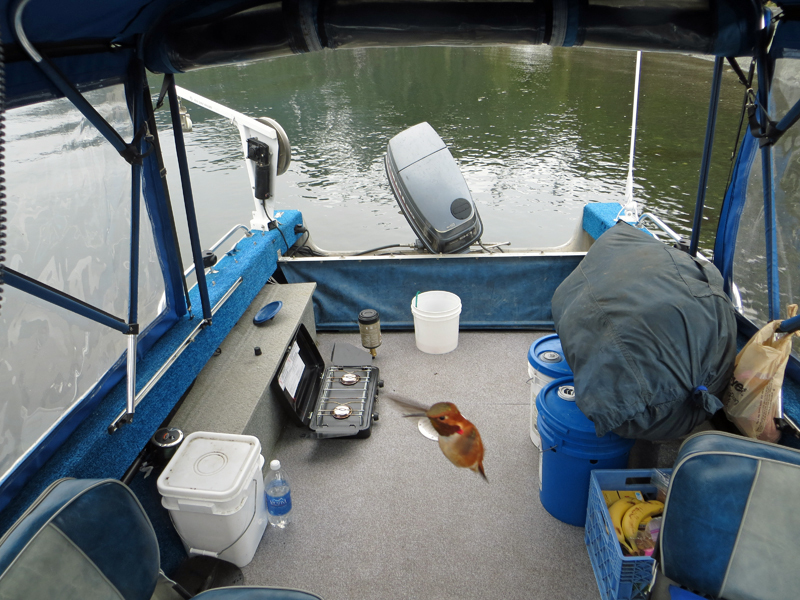 A hummingbird flew inside the cabin the first morning. He loved my red scarf. He flew by several times that day. My scarf must have been so disappointing to him. We used three shrimp pots and picked them twice a day and brought home 140 shrimp. 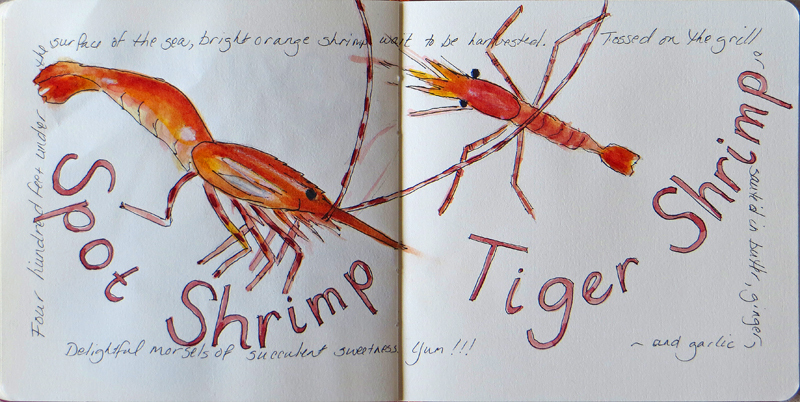 The striped one is actually called a Coonstripe Shrimp. Didn’t know that until we got home. 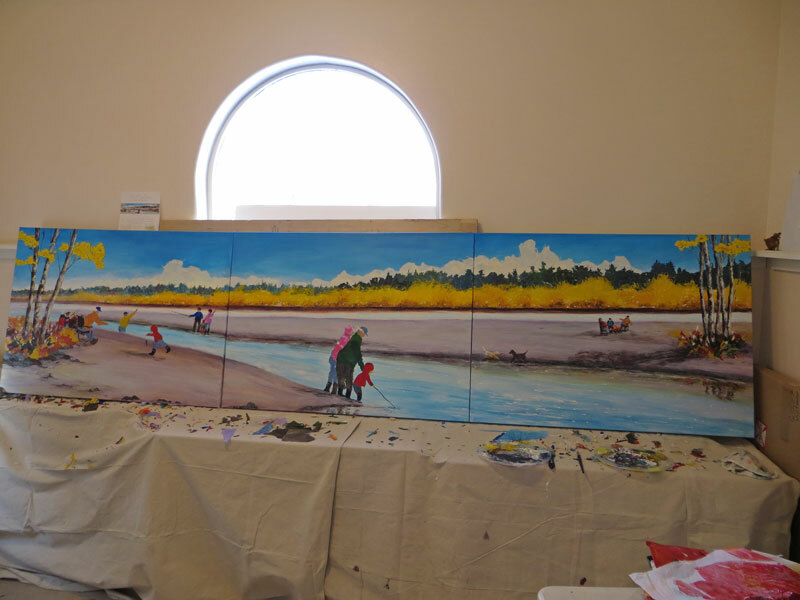 The collage for Fairbanks Pioneer Home is finished! There was a little hold-up when I checked on the new container of varnish and read, “do not ship for one to two weeks after applying varnish”. Those instructions weren’t on the other containers I had so unfortunately it was delivered a bit later than I’d intended. I’m excited to see photos of it installed. Here are photos of the finished piece and some details. I included a special memory of mine you can see in the detail below. The lady on the left holding the little girl with dark hair could be my grandmother and me years ago. Yesterday I took part in Palmer, Alaska’s third annual Who Let the Girls Out event. I taught two watercolor classes. 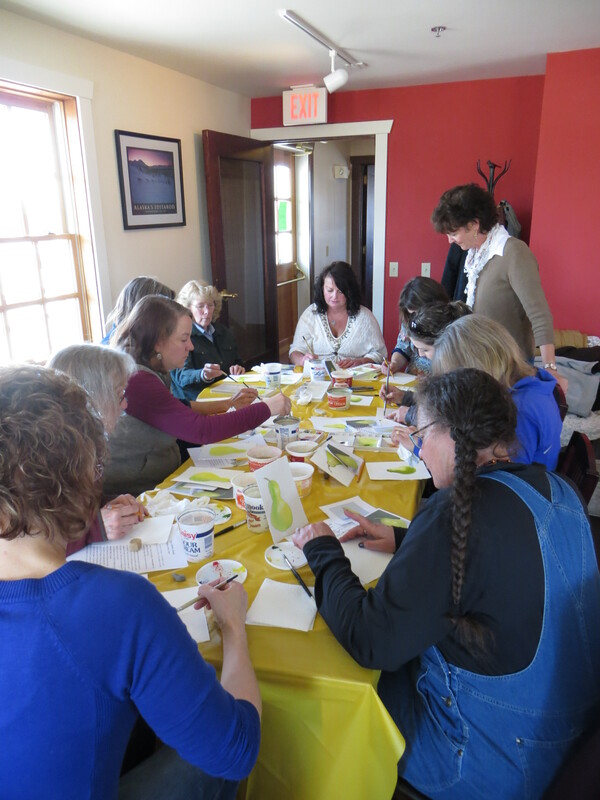 Twenty enthusiastic ladies showed up and we had so much fun. 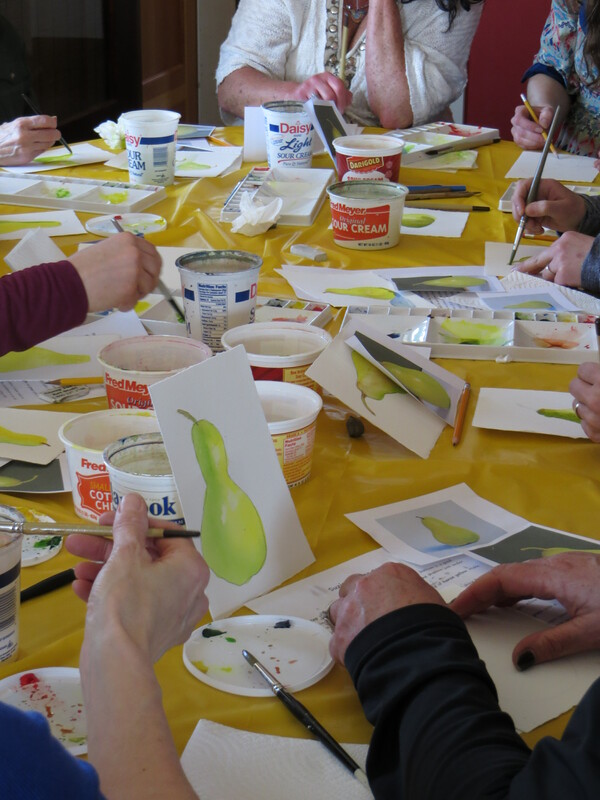 The first class was painting geraniums and the second was painting pears. Here are some photos. 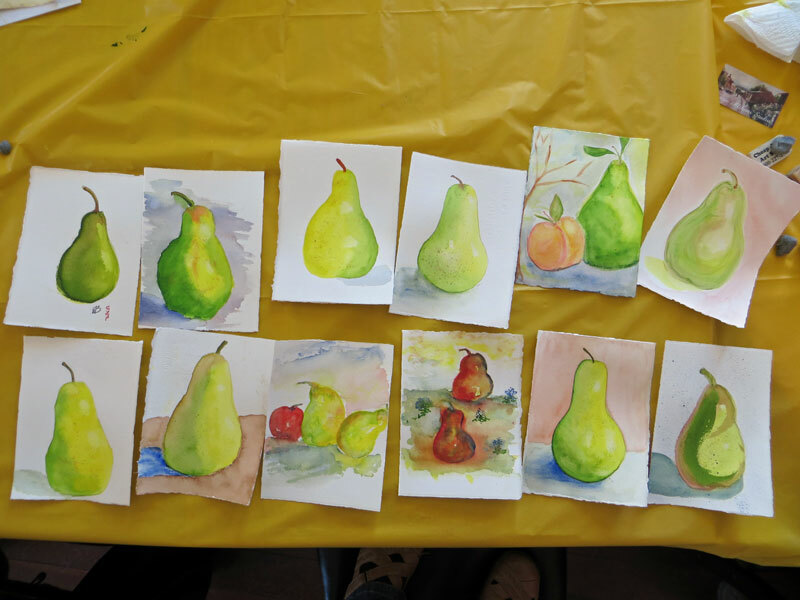 We had a wonderful time and all the pears turned out so beautifully. Even though we got squeezed out of our reserved class space and into a littler space, these ladies went with it and made the class a great success. Well done! 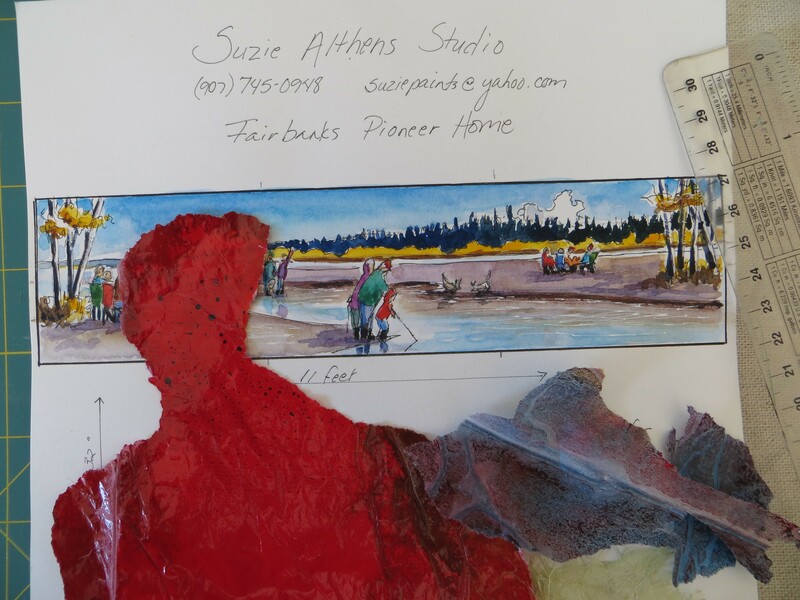 Paper and paint have been flying around the studio, and it is fun to see the image evolve. 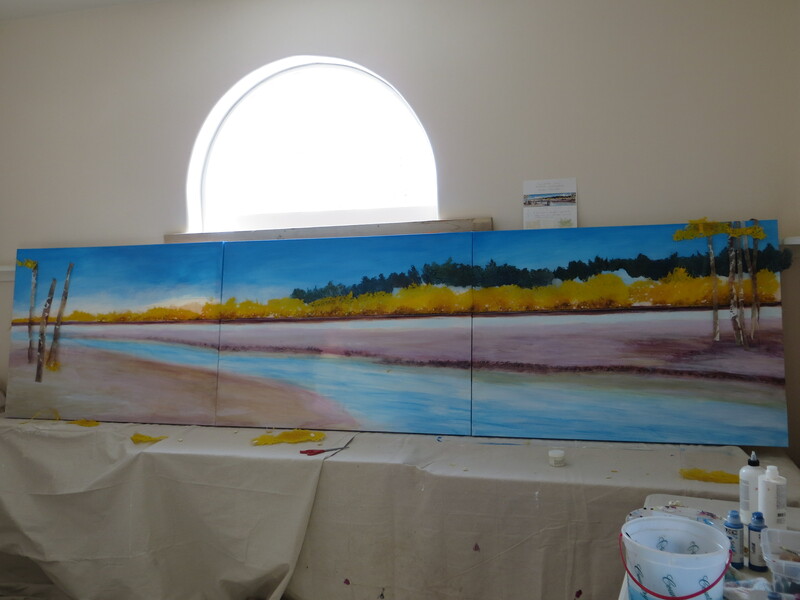 I started with laying down the trees since they will act as bookends for the piece. I’ll add paint to the paper to suggest shade and light later. Then, I began making people out of different colored paper. 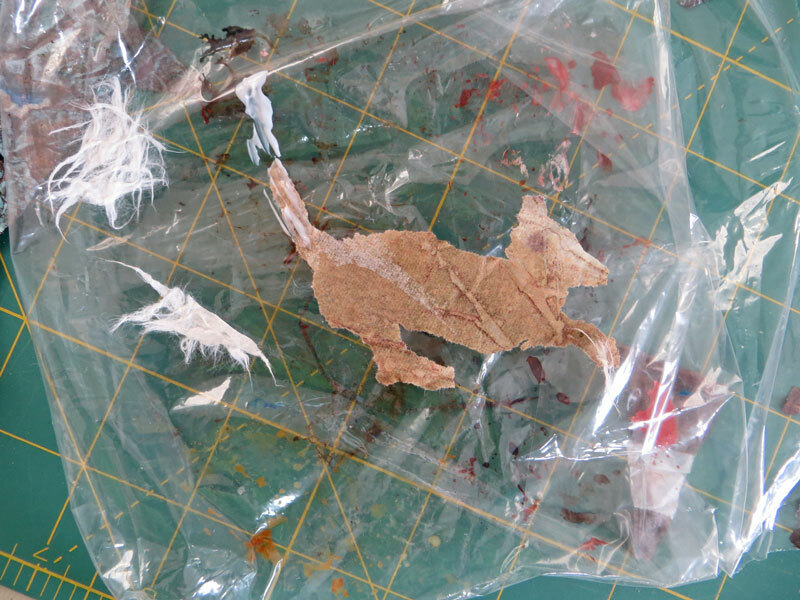 I made one dog by starting with colored tissue paper and adding texture with mulberry fiber. This is what he looked like when I was finished with him. I wanted him to be a shaggy, friendly dog. 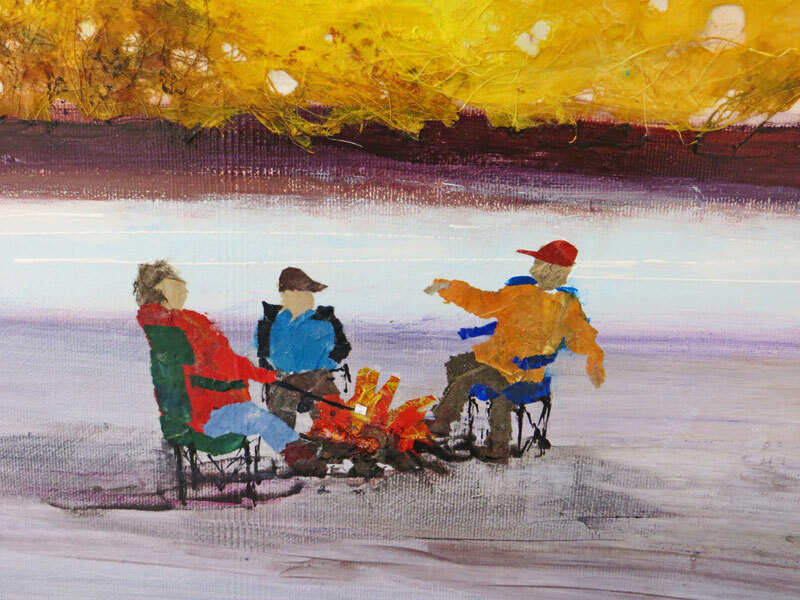 The fire that the group was sitting around started out as a raging inferno, but with a few rips and tears, it calmed into a friendly campfire. This is what I see as I walk into my studio. I will leave it for two weeks, then look at it with “fresh eyes”. I’m going to get on a plane and go to Italy for those two weeks! I’m hoping to post while I’m there, but if not, you will see some of my sketches and I’ll tell of my adventures when I return. 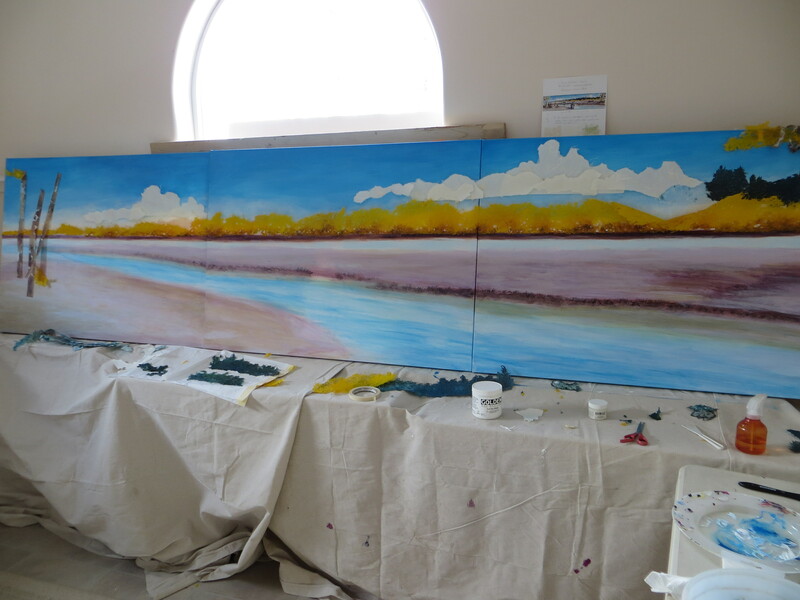 The first part of creating the collage started with blocking in the sky, the river and sandbanks. 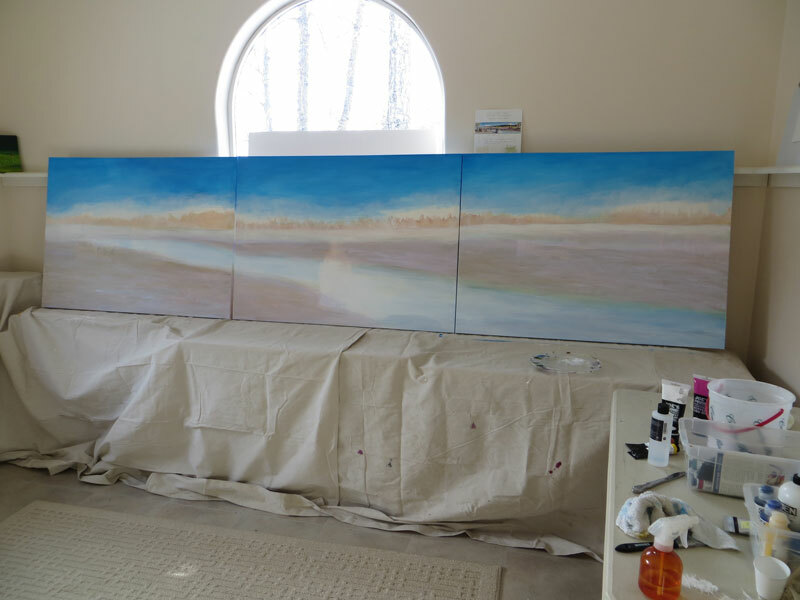 Bands of horizontal color will span the entire painting. 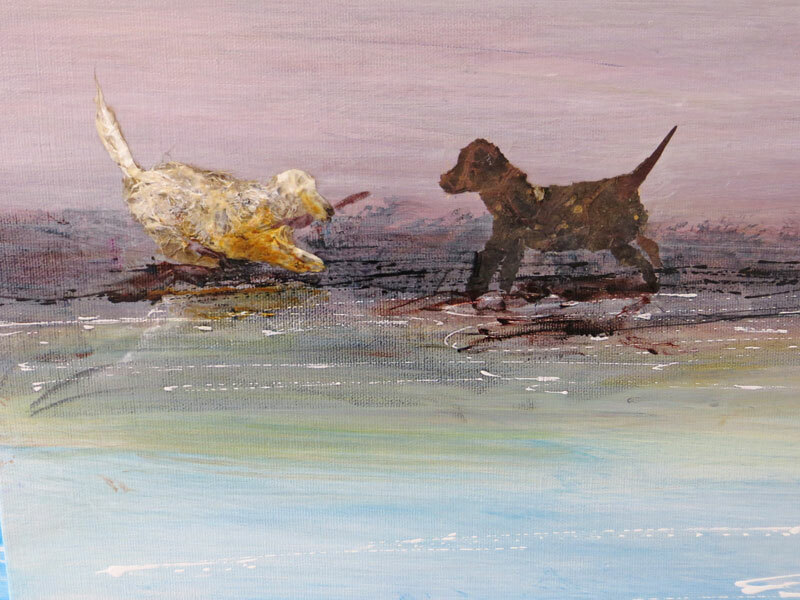 I use a rubber “shaper” to mix paint and to apply soft gel to the paper, but I mostly used a natural sponge for painting. 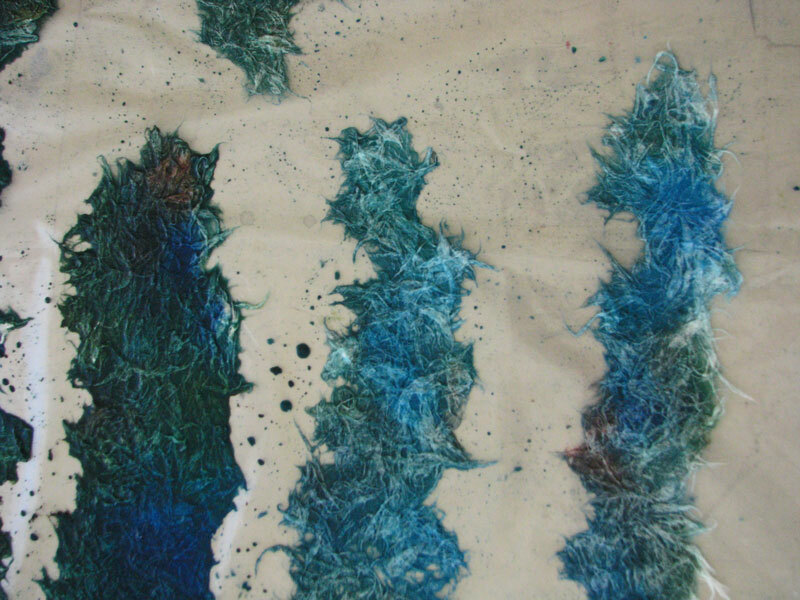 In this photo I’m using cyan blue and manganese blue, blended with glazing medium for the water. 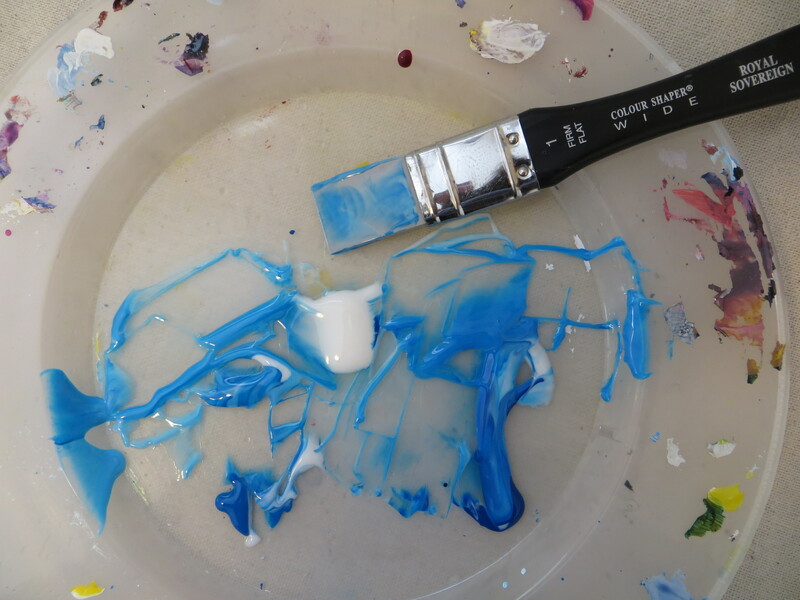 My palette is a plastic plate. 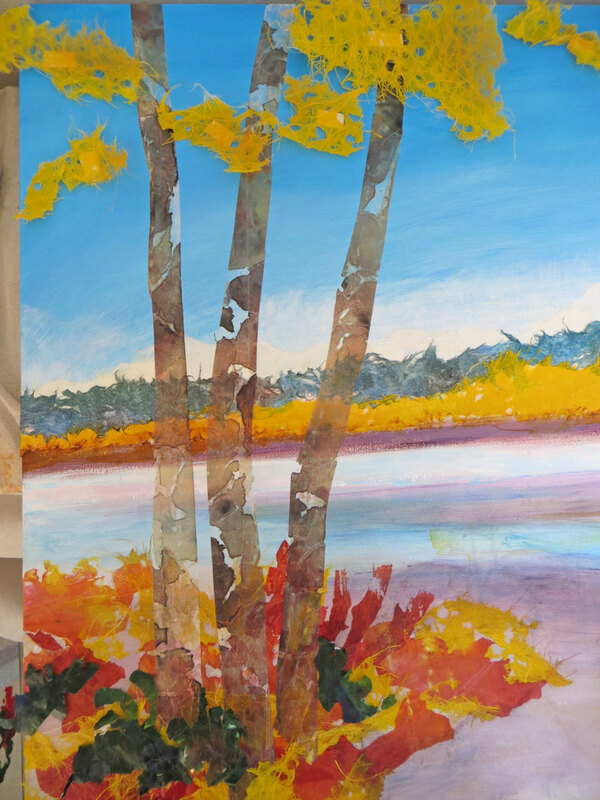 The brightest color will be the yellow of the trees, but they needed to show more shape so I lightly sprayed the bottoms of the yellow paper I’d already painted and dabbed on darker quinacridone yellow to create the undersides of the trees. 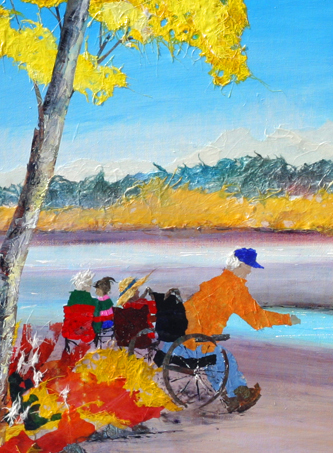 I added a few darker shades with a combination of quinacridone burnt orange and cyan blue. 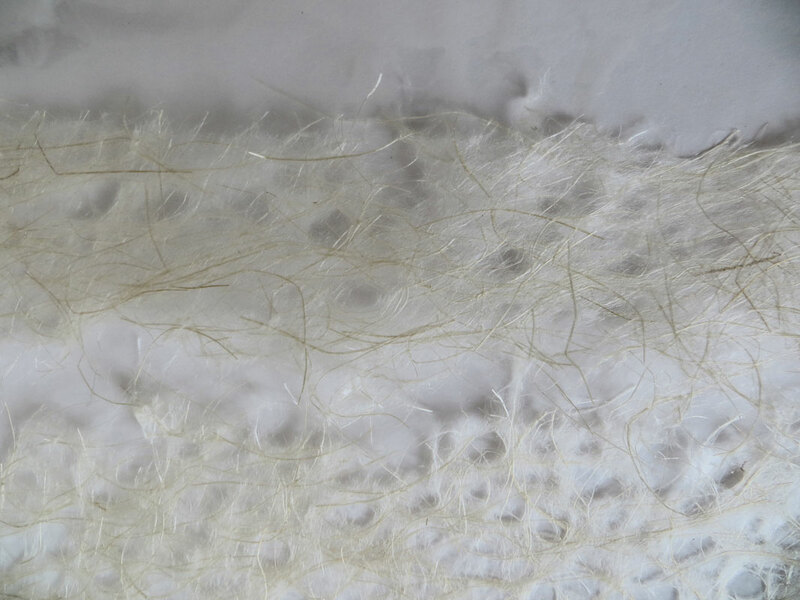 Because the fibers were wet, it created soft edges. I needed to get a feel for how the colored paper would look on the colored canvas. 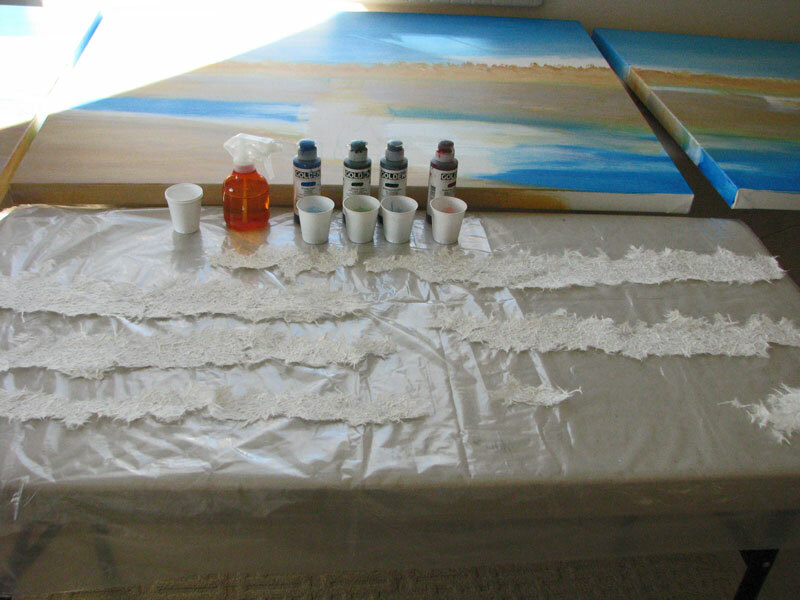 Using some low tack masking tape made for drafting, I stuck the papers temporarily onto the canvases. I got a bit ahead of myself and started gluing down the dark spruce trees. 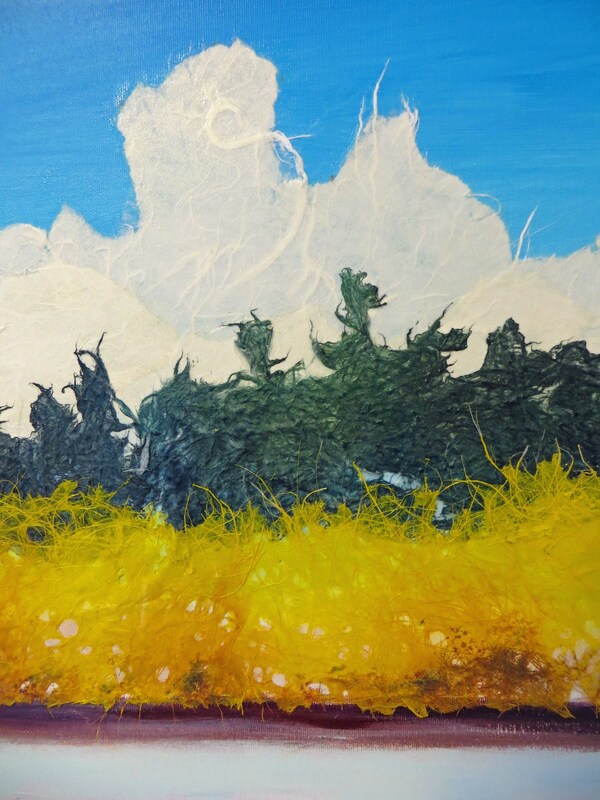 I quickly took them off and put the clouds on, then put the spruce trees over them. Whew! 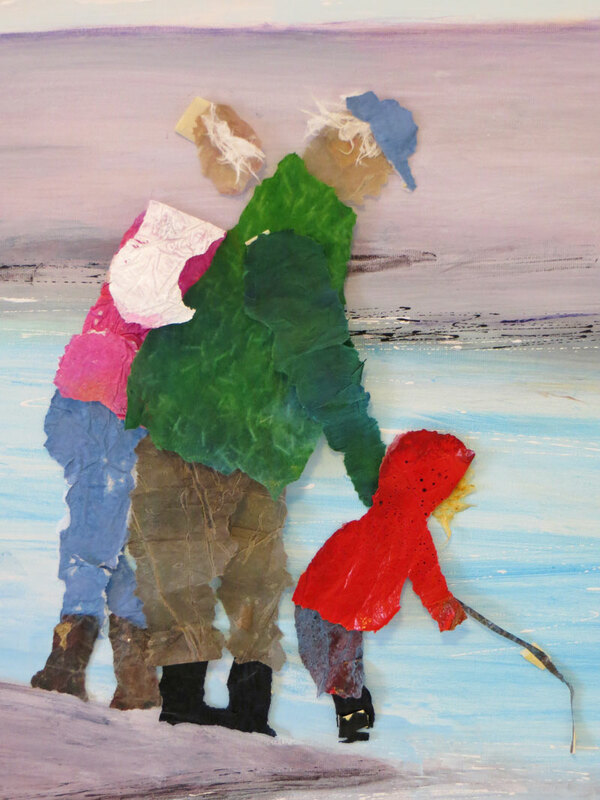 I glued the pieces of paper by turning them upside down on the plastic bag, then spreading them with the soft gel. 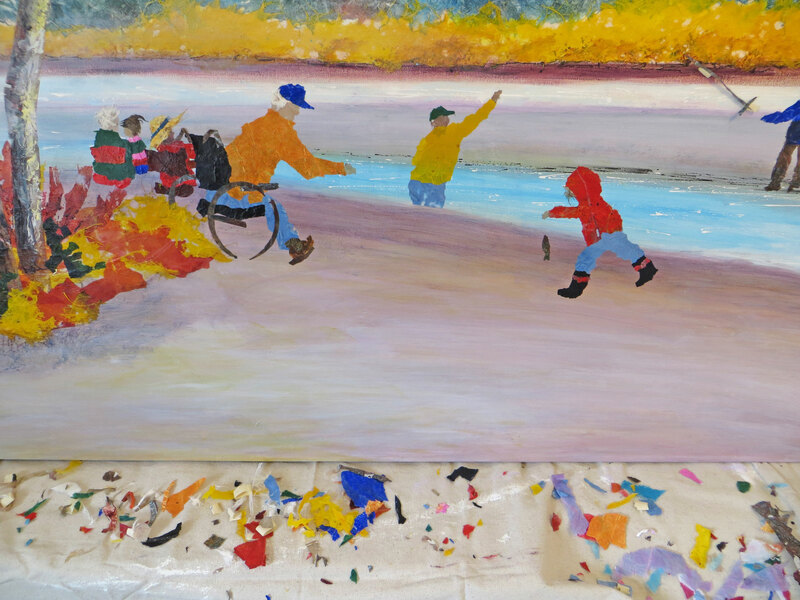 Below is a closeup of the sketch I’m working with and one of the jackets of the children playing on the beach. Like playing with paper dolls! As of today I have several people cut out and I’m moving them about on the beach. 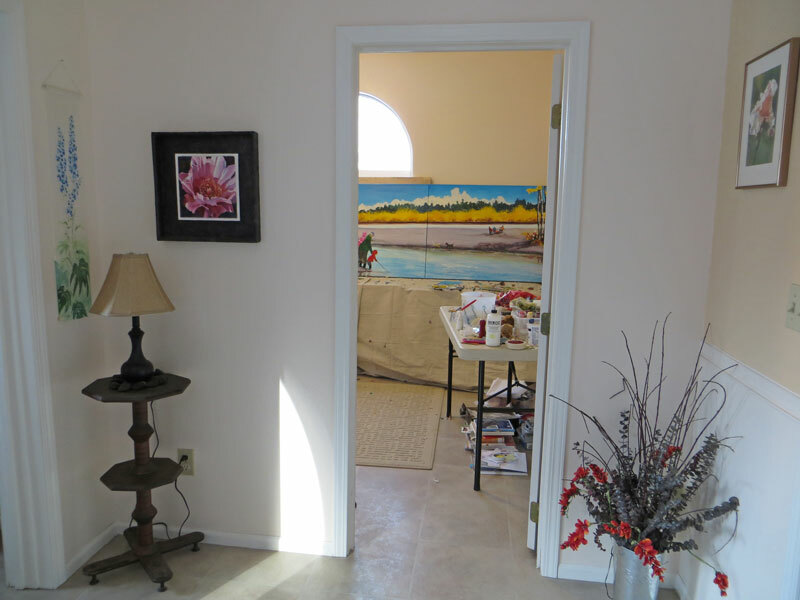 Last week I started a collage with three canvases 32″ x 44″ each. 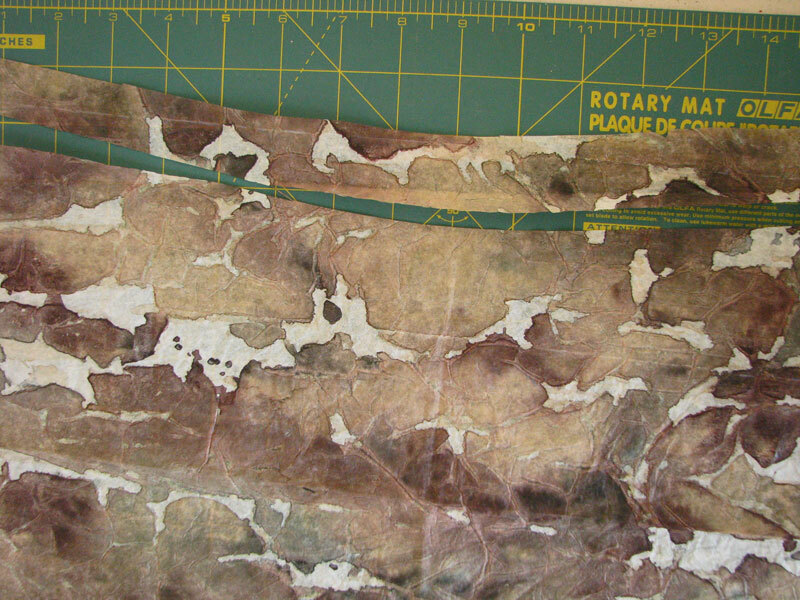 After applying two base coats of gesso, I brushed on a thin coat of base color using Golden Fluid Acrylic. 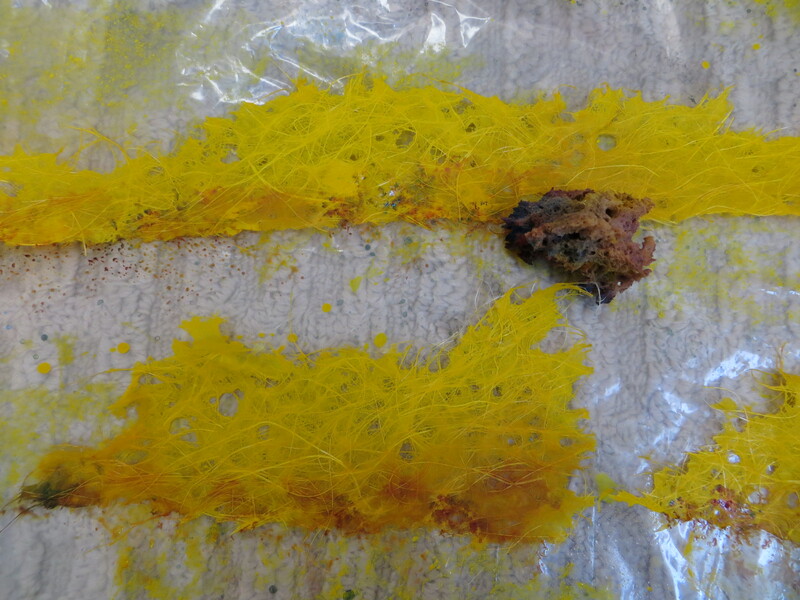 It is a thin paint with lots of pigment so it doesn’t take very much to cover. 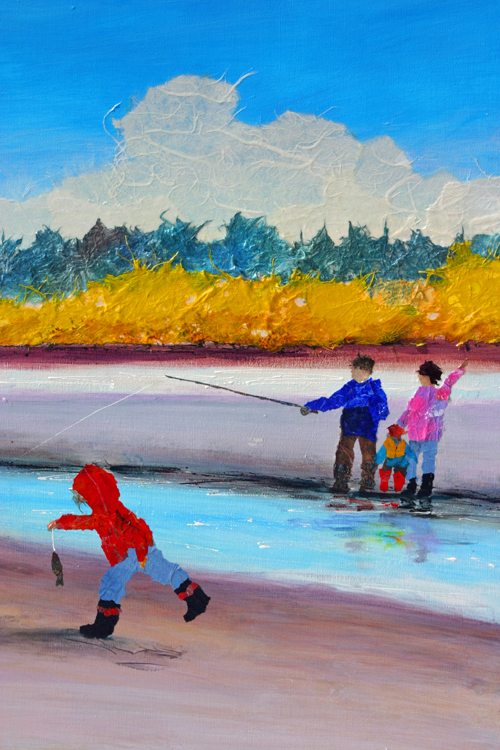 I use it like watercolor, allowing the white of the canvas to show through. 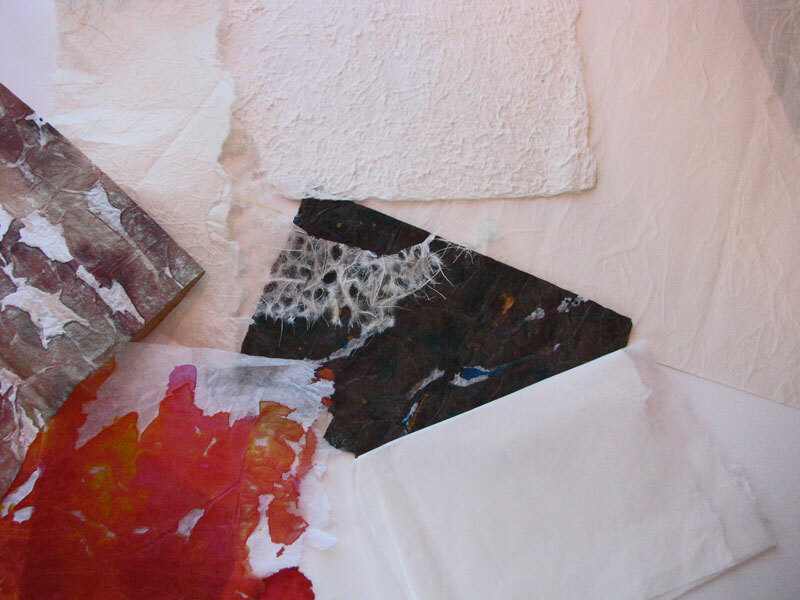 As the paint dried, I selected papers to use based on texture. Some of these papers are handmade in Japan, others I made with tissue paper and paint. Here is a post about how I do that. Ready…set…go! 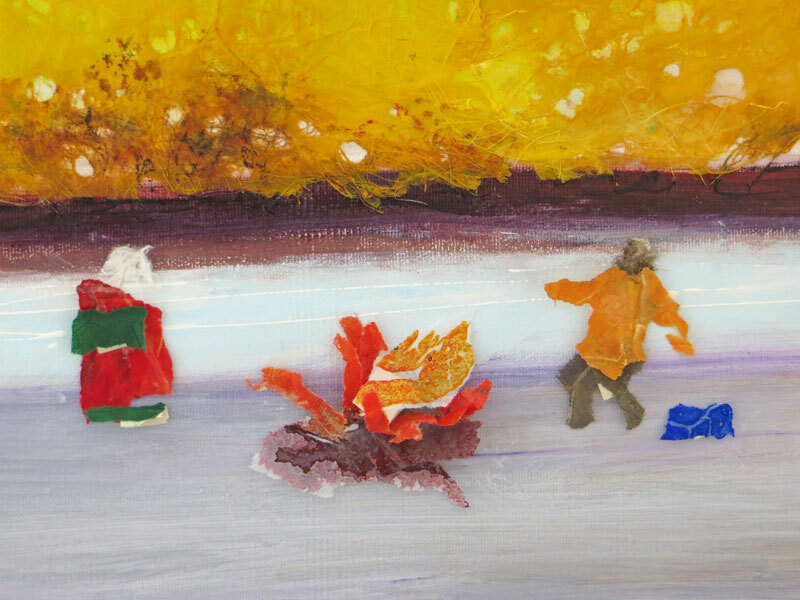 The little cups are holding diluted colors to make the spruce trees using Jenkins green, quinacridone burnt orange, primary cyan and anthraquinone blue. First I spray the pieces of paper which are lying on a trash bag. I allow the paint to blend by itself. If the paint isn’t blending, I spray it with more water. 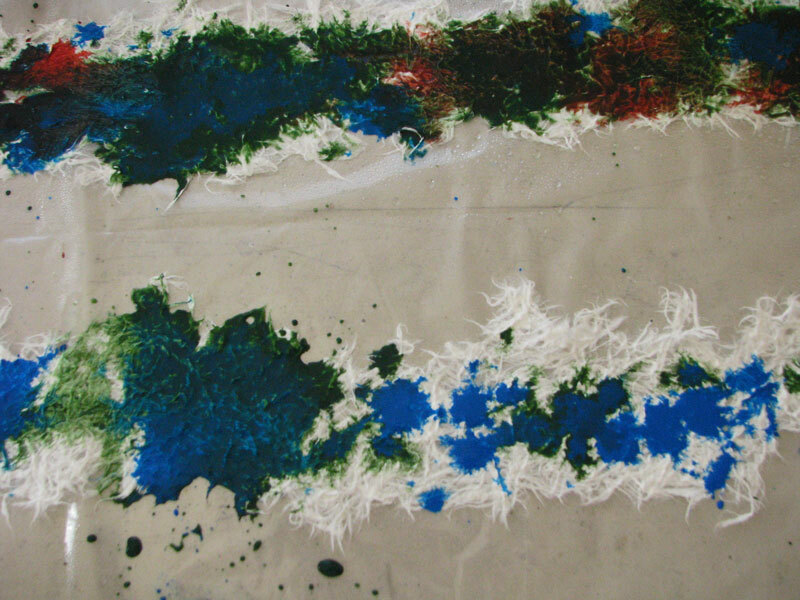 The paint on the paper in the lower right will be sprayed and it will flow and all the fibers will be covered. 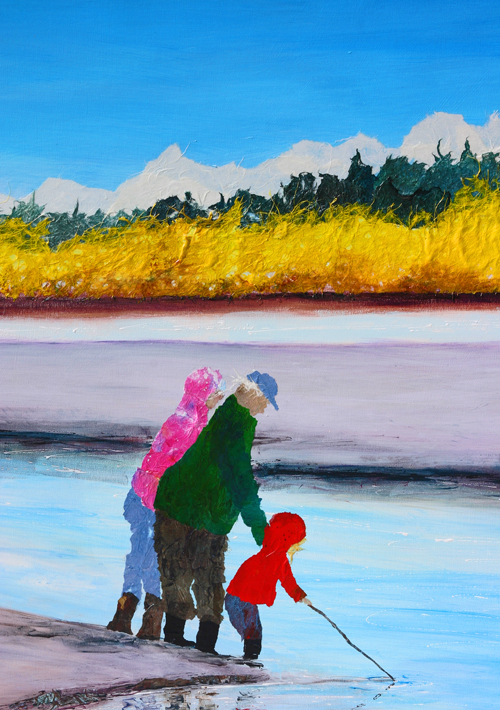 After pouring the paint, I dabbed at some with paper towels to make distant spruce trees. This Japanese paper is made by water dripping on it to make the holes. 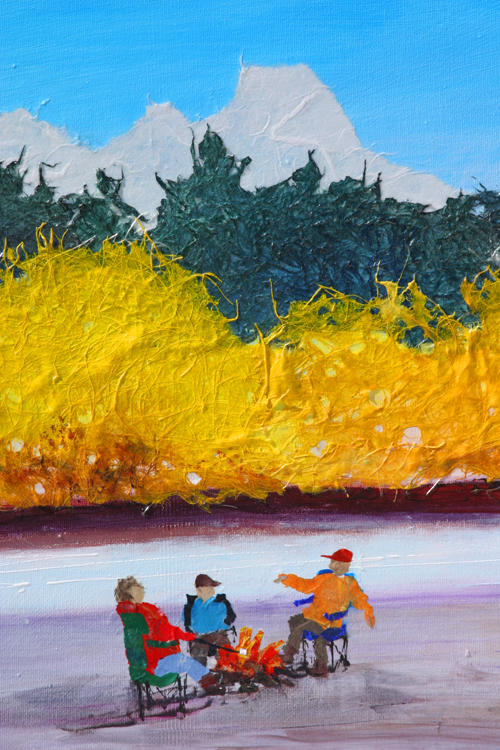 I tore it into pieces, then used yellow and quinacridone gold to add variety and make it look like tree shapes. The perfect color of autumn birch leaves! I tear most of the paper used in the collage because I don’t want hard edges. 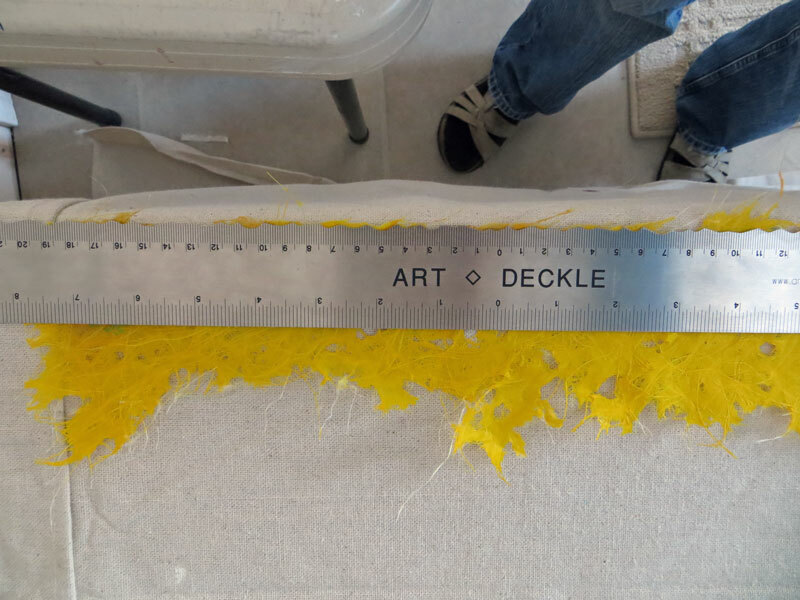 The leaves need to have an edge on the river bank though, so I use this ruler with a deckled edge to give the paper a soft, uncut edge. 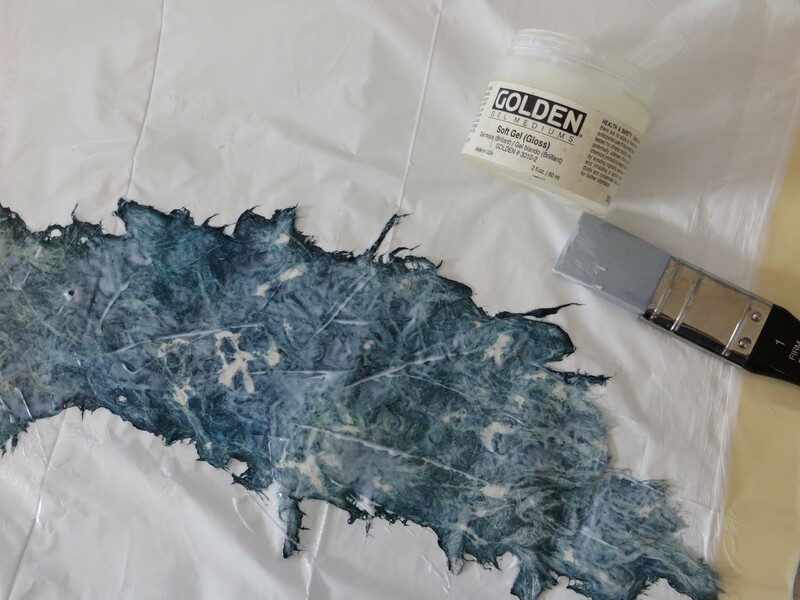 This paper is perfect for birch trunks. I used a rotary cutter to make this tree trunk. 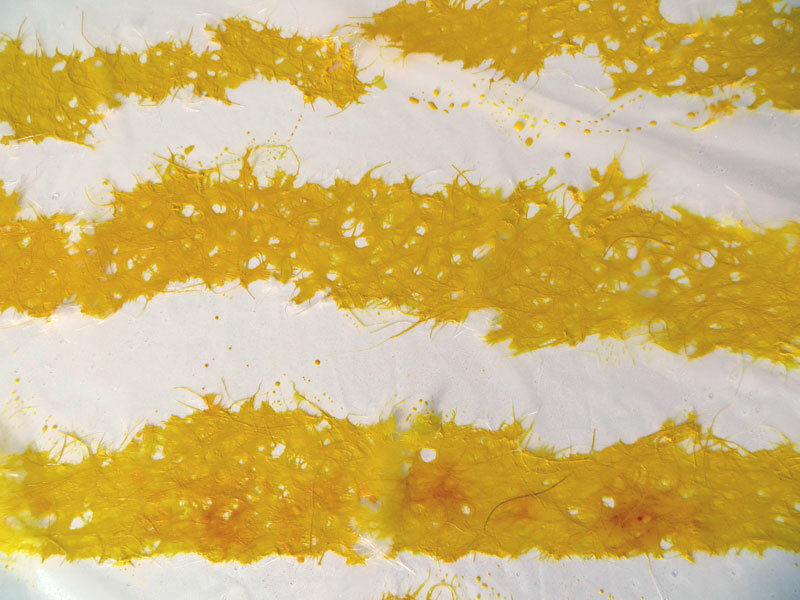 This is tissue paper with paint. I’ll begin sticking the paper temporarily on the surface next. That gives me a feel for color of the water and sand and I’ll make adjustments before gluing the paper down permanently. Thanks to Daniel Smith for excellent service and products.